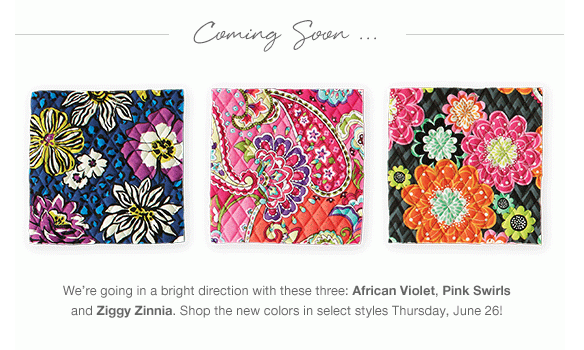 Did you see the email from Vera Bradley this morning announcing their new colors for Fall? We will get to see them in person June 26th! OOOOH! Right at the moment, I am drawn to the African Violet! I love the African Violet, navy is so hot right now! The other two are awesome too! Three for three this go round Vera! I'm hoping the one color in African Violet is really violet, instead of hot pink. I'm sick of so much pink. Not a fan right now. Maybe they will appeal to me in person. Surprised to see Ziggy Zinnia available tonight in the new "Ultimate Backpack" and "Tech Backpack". It's cute but I'm not digging the pink/orange zigzag inside color pattern. The Ultimate Backpack is bigger than the normal Backpack and has 1 zipper inside and 2 pockets under the front flap and 1 on each side The Tech Backpack was the same size as the Laptop Backpack. Can't wait to see African Violet and Pink Swirls! Hmm not sure if I'm really loving any. I wish the Pink Swirls was blue. I'm sick of so mich pink too, but am all about paisley. Definitely don't like the Ziggy Zinia; have to say African Violet is most liked. I may or may not get something in it. Will have to see in person first. Fun blog you have here by the way. Does anyone know anything about the different products coming out in the new patterns? Specifically I am wondering if there will be new crossbody styles. I've seen all the colors but are there any new handbag or wristlet styles coming in July?